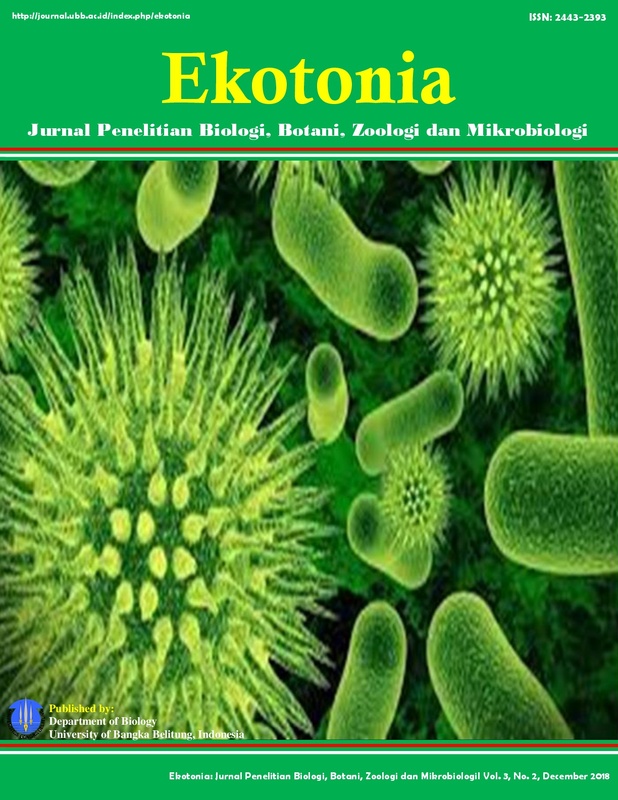 Ekotonia: Jurnal Penelitian Biologi, Botani, Zoologi dan Mikrobiologi, accept articles in Indonesia and English by covering several topics of biological studies such as botany, zoology, and microbiology. This journal encompasses original research articles, review articles, and short communications, including: plant growth; reproduction; metabolism; plant development; plant evolution; comparative anatomy; animal psychology; molecular biology; ethology; behavioral ecology; evolutionary biology; taxonomy; paleontology; bacteria; fungi; microscopic algae; protozoa; archaea and etc. ISOLASI DAN KARAKTERISASI Rhizobium DARI Glycine max L. DAN Mimosa pudica Linn.